Get started with two months free. Our "stupid simple" logging system captures your errors and alerts you when they happen. No more unknown errors. Then we gather all that error information into a single, actionable dashboard. Have you ever added a "great" new feature to your app and then wondered if anyone was actually using it? Stop wondering. 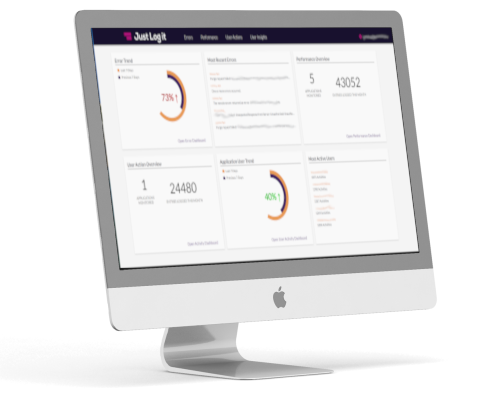 JustLog.IT's user insights give you full visibility into everything your users are doing in your app. Everyone knows a slow app is a frustrating app. But it is really hard to track performance metrics from production apps. JustLog.IT allows you to capture production metrics so you know where you have issues. Don't be blind to what is happening with your application. JustLog.IT dashboards show you what's happening in near real-time. The decision you have to make: build or buy. Sure you could spend the next few months building out a logging system, consuming the time of your staff, struggling with requirements and deployment. Or, you can just use our awesome already built logging system. When you put it that way, almost seems like a no-brainer, doesn't it? Developers are expensive. Really expensive!! Don't pay them to spend time writing a logging solution that will still be crappier than JustLog.IT. Pay them to write software that helps your business. Pretty sure that's why you hired them in the first place. Focus your resources on building software to grow your business or, even better, make the world a better place. Building your own logging solution is a waste of time, money, and purpose. Trust us, your developers would much rather solve huge problems then write an internal logging sytem.